This New Toro Beast 200A Brushless ESC is an upgrade of TORO EX200A for 1/5 scale car. It is usable with 4S to 8S LiPo packs and comes with a 6 /7.4V@15A BEC system and can be widely programmed by Program box or SKYLINK USB interface . 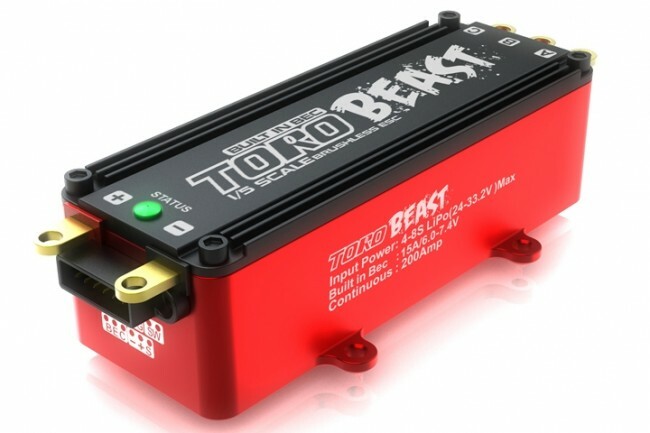 This upgrade Toro Beast 200A has more advantages, one of main features is it is a BEC ESC,and the BEC is adjustable with 6V15A or 7.4V/15A. It also has new high performance heat dissipation power boards ,bearings and lowest resistance . It easily runs up to 10 horse power range applications with these advanced features. 15A Maximum output current . • Support LiPo batteries up to 8S. motor rpm, and controller temperature. • Red copper connector is used internally of the ESC. It can decrease the internal resistance at high current situation. that the dynamic thermal equilibrium can be got.